Todd Ketcham, the Book Cellar’s chief bookseller, talked about independent bookstores and the publishing industry. The key to the Book Cellar’s success, Ketcham says, is that “every item in the store is here because someone who works here fell in love with it, and they know they can sell it.” Ketcham presented ideas for partnerships between libraries and independent bookstores — including hosting local author showcases and promoting each other’s events — to ensure that authors who should be heard have a chance to be heard, and read. He recommended the Authors Guild survey as an excellent resource for more information about the current state of the writing profession. Median author income was $6,080 in 2017, down 42 percent from 2009, with writers of literary fiction experiencing the biggest decline. 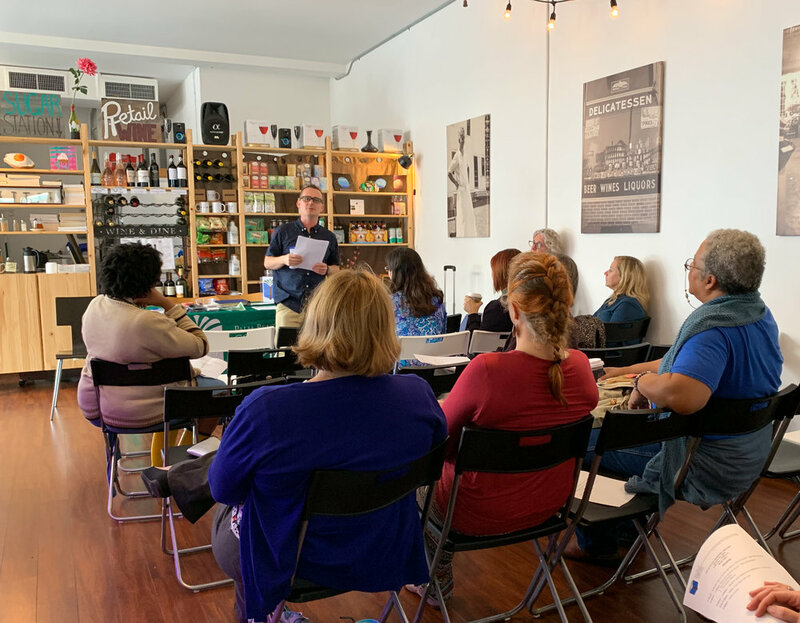 Todd Ketcham, the Book Cellar's chief bookseller, leads a lively discussion about how bookstores and libraries can work together. Marisa Montesino of the Palm Beach County Library System is the lucky raffle winner. PBCLA President Graham Brunk and PBCLA Vice President Elizabeth Griffin represented the association at the Library Legislative breakfast at the Four Arts King Library on Monday, Dec. 3. Palm Beach County Library System Director Doug Crane presented data and information about libraries in Palm Beach County to local and state legislators. PBCLA’s first library tour of 2018-2019 was Friday, Nov. 9, at Palm Beach State College’s Harold C. Manor Library at the main campus in Lake Worth. Thank you Janet Naughton and Raychell Harris for a fun and informative behind-the-scenes look at the college library. After the tour, participants competed for prizes in an inaugural round of the game "How much do you know about PBCLA?" created by Janet. Karen García of the Palm Springs Public Library and Isabella Rowan of the Delray Beach Public Library discussed their work building libraries and supporting communities in Guatemala and Kenya. Karen and Isabella both received PBCLA professional development awards that helped to fund their trips. Karen, who is from Guatemala, traveled to the country with 12 other librarians from California, North Carolina, Texas and Canada on a Librarians Without Borders service trip. The group set up a school library, where they worked with students of all ages and taught teacher and parent workshops. Isabella’s trip to Kenya was part of Project Humanity’s Kenya Library Project. She brought books to islands in Lake Victoria in western Kenya for schools in the islands’ rocky, rural hillsides. Elementary school is free in Kenya, but books are expensive. A single paperback can cost a day’s wages. Find out more about the Delray Library’s continuing partnership with the Kendu Bay, Kenya, community on The Kenya Library Project Facebook page. We raised over $230.00 for PBCLA and had a lot of fun doing it. Thanks to all that turned out. See you next month at our next event. For more information visit our events page here. The 2018 Spring Quarterly meeting featured guest speaker Cristina Farah. She discussed the benefits to both librarians and the community on bringing social workers into libraries. The presentation was followed by a tour of the Delray Beach Public Library that included the newly renovated children's area that features a recording studio, 3D printing, and many interactive technologies. Join us for our next event, a PBCLA Social from 7-9pm on April 27th at California Pizza Kitchen in Wellington. For more information, visit the events page. For our 2nd Library Tour of the year, we visited the Spanish River location of the the Boca Raton libraries. Library Manager, Ann Nappa led a tour for PBCLA members that included a visit to the rooftop terrace. The group then sat down for a round-table to discuss advocacy efforts taking place at the city libraries in Boca Raton. Topics discussed included: meeting community needs, anticipating future trends, and current initiatives of the library. We hope to see you at the next library tour this Summer at Palm Beach State College, please visit our events page for more information to come. Our December PBCLA Social was held at Christopher's Kitchen in Palm Beach Gardens. Food, wine and fun were on the menu! See you at the next social! The 1st stop on our new PBCLA Library Tour series! PBCLA members got a behind the scenes look at the Saint Vincent De Paul Seminary Library in Boynton Beach. Join us for our next event a PBCLA Social on December 8th at Christopher's Kitchen in Palm Beach Gardens. For more information, visit the events page. Join us November 3, 2017 for our next event a PBCLA Mixer/Fundraiser that will be held at Blaze Pizza in Royal Palm Beach. For more information, visit the events page. 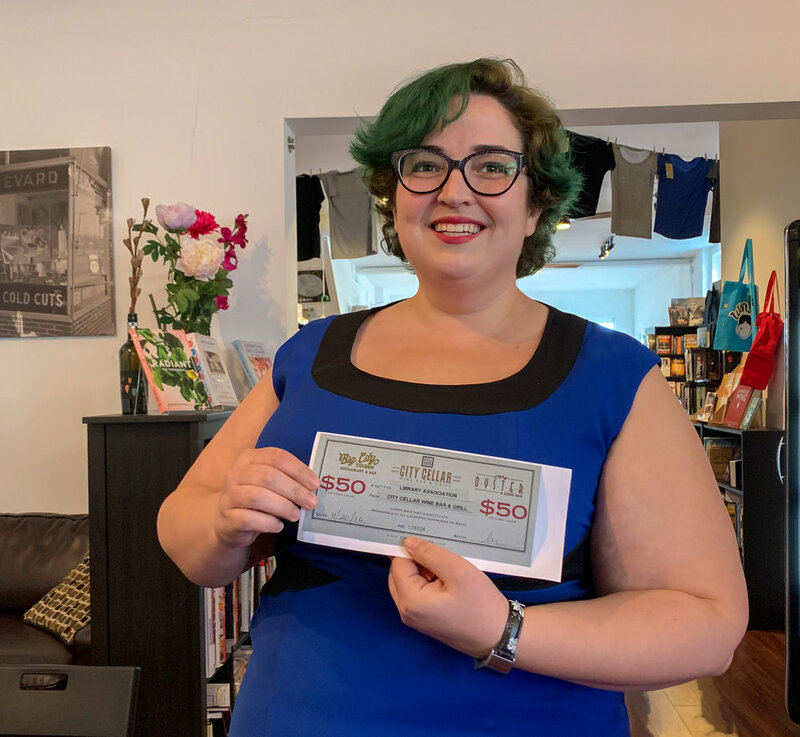 A big thanks to Agliolio's who hosted PBCLA this month and also donated a gift card to the organization that we will raffle off at the next quarterly meeting. The food was great, the company was lively, and there were a few new faces! If you missed out on the fun, be sure to join us October 18th for our Quarterly Meeting that will be held at the Mandel Public Library in West Palm Beach. For more information, visit the events page. This month PBCLA members got together at Dave's Last Resort. This casual tavern, with it's funky artwork was just the place to get the weekend started. A fun time was had by all! Come join us for our next event to be held at Agliolio's Italian Bistro & Bar. Visit the events page for more details and to RSVP. The 2017 Annual Meeting featured several speakers that offer services to special populations in Palm Beach County. The organizations that presented included: The Agency for Persons with Disabilities, The Homeless Coalition of PBC, The Mental Health Association of Palm Beach County, PBC Youth Services Department, and The Arc of Palm Beach County. Our meeting included a PowerPoint overview of the activities and fundraising done by PBCLA this year and the election of the new officers to the Board of Directors. The 2017 Spring Quarterly meeting featured speakers from both the Compass Community Center and the Palm Beach County Human Rights Council. These representatives discussed how their organizations support the LGBTQ community of Palm Beach County. The presentation was followed by a tour of the Compass Community Center that included time for browsing the Joel M. Starkey library. Our 2017 Winter Quarterly meeting featured speaker Patrice Schroeder from the 211 HelpLine for Palm Beach and Treasure Coast, who joined us to discuss the services they offer, including the Crisis line, programs for elders, teens, and families, as well as mental health and suicide prevention. Also, Rebekah Stewart, the Palm Springs Children’s Librarian, introduced us to the library and highlighted the various services and programs they offer followed by a delightful tour of the facility. The 2016 Fall Quarterly Meeting featured guest speaker Mary Ann Hodel, Director/CEO at the Orange County Library System. She discussed the library's outreach activities that were organized in response to Orlando's tragedy at the Pulse Nightclub where 49 individuals lost their lives. Thank you to the Lynn University Library for hosting our event at the World Performing Arts Center, and for the tour that followed. The 2016 Annual Meeting featured a riveting keynote speech from Sharon Koskoff, founder of the Art Deco Society Palm Beaches. Thank you to the Four Arts King Library for hosting our event, and for the wonderful tour. Welcome to 2016-2017 Board. The forecast looked dark and grim on Friday but was soon relieved by an evening of camaraderie and fine Parisian food and drink. The PBCLA Talk & Taste at Le Rendevz-vous was a wonderful success! We were fortunate to welcome several new and familiar faces to our informal gathering. If you missed out on the fun, don't worry! Plans are already underway for the next PBCLA Talk & Taste. Stay tuned to our social media and remember: "Mangez bien, riez souvent, aimez beaucoup"
Our 2016 Spring Quarterly meeting featured an illuminating and insightful address from our keynote speaker, Dr. Kathryn Miller, from Florida Polytechnic University's "Bookless" Library. A group of roughly thirty library professionals from across Palm Beach County gathered to network and share ideas, as well as enjoy snacks and a chance to win a raffle basket filled with great movie-related prizes. Be sure to check our Events page to see where you can join us next! 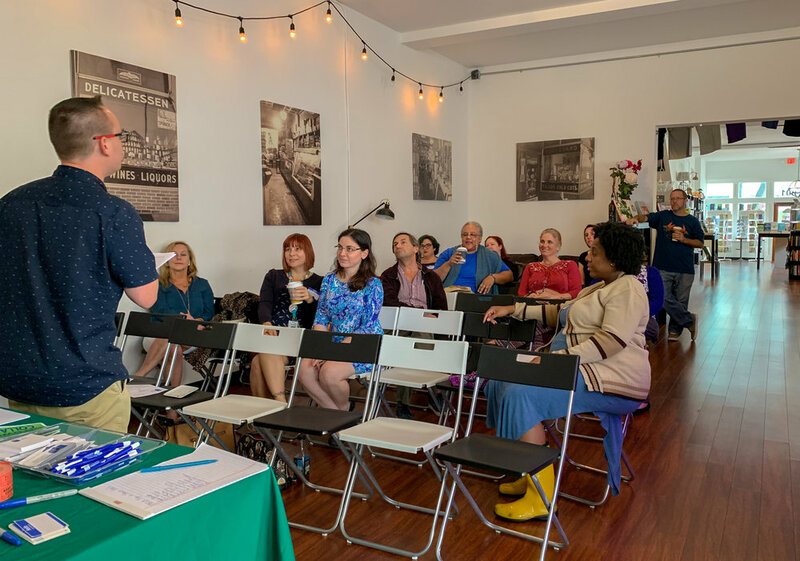 A small but dedicated group of "Talk & Tasters" met up at the fun and funky Brewhouse Gallery in Lake Park to mull over the ins and outs of mentoring new library professionals. The group fortunately consisted of a few former mentees and mentors with the Palm Beach County Library System. The venue provided a good mix of tasty indulgences, common areas to gather/chat and a wide mix of games to easily distract all of the "talk & tasters". An epic game of Jenga by a skilled group of players was the perfect distraction! In keeping with our theme, there was a little bit of "mentoring" between players! A fun and worthwhile night for all! Be on the lookout for our next event! Scrabble fever was in the air at the North Palm Beach Library where the Palm Beach County Library Association was hosting its inaugural Scrabble Tournament Fundraiser! Sixteen scrabble players, from novice to skilled, gathered to put their word knowledge, spelling abilities and strategic playing to the test. The tournament began with four groups of four squaring off and then the overall top four scorers moved on to the final round to determine a champion. To help soothe the players, tasty samples from the PBCLA Cookbook were featured! Be sure to be on the lookout for our next tournament!